Some people come into this world a little more fine-tuned to subtle human behaviors and emotions than others. Their senses are heightened, so they pick up on things that often go unnoticed by everyone else. For example, maybe you and your friend just met someone, and while you’re chatting it up and having a good time, you notice your friend isn’t so keen on socializing with this person. They’re quiet and not too enthusiastic about having to be around him or her. It’s because they’re reading a piece of their body language that you haven’t picked up on yet. When a person is wearing a guise to mask their true selves, red flags start shooting up in the mind of the empath. They recognize the manipulative behaviors for what they are. This is a problem for empaths because they can only respond with inauthentic people with their own version of inauthenticity, and they’d rather not waste their time on superficial interaction. These are the types of people who want everyone to like them, so they feign interest in everything a person has to say, agreeing, but never really listening to what you’re really saying. Empaths are fully aware that this person has no true interest in anyone other than themselves, so they don’t readily open up to conversation with this person. The empath will likely respond to this person in a very droll, uninterested manner. Empaths and highly sensitive folks are completely aware of all the different ways to compliment someone, and that includes the compliments that are really meant as insults or criticisms. If you’re not sincere in your compliment, empaths believe that you shouldn’t say anything at all. 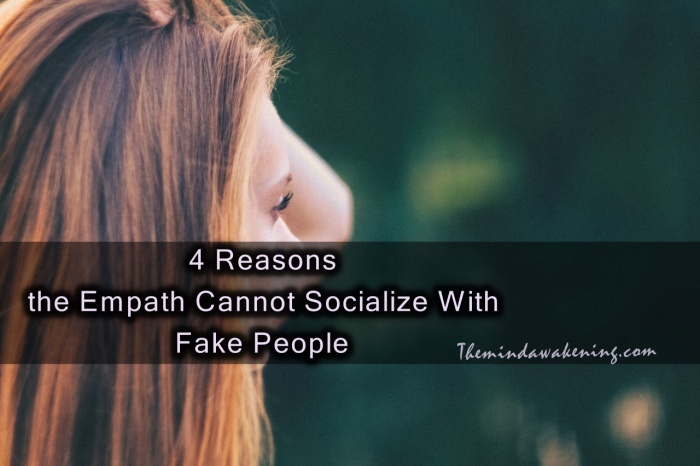 Empaths struggle greatly with these people because it’s impossible to form any sort of connection with a fake persona that doesn’t actually exist. In rare cases, empaths will want to bring out the real person hiding behind the mask. But, when this doesn’t work, they’re simply left dumbfounded at this person’s inability to self-validate. Empaths have an incredible capacity for being able to feel what others are feeling without any words being spoken. If you’re holding a lot of pain inside and trying to hide it from others, the empath is one person who sees right through you. They feel the pain you’re feeling; hiding it only makes it more intense. They recognize that trying to talk to someone about their pain isn’t always desired by the other person, but sometimes they try, because empaths are often the only ones who can remove the mask in order to help a person heal.